Does having a wonderful smile really matter? According to recent studies it does, as 73% of Americans say they are more likely to trust a person with perfect teeth than someone who has a powerful job or is well dressed. And another poll found that one-third of people say that the first trait they notice about a person is his or her smile. But what’s more important than these statistics is the way your smile makes you feel. Does it give you the confidence you need to start each day? If not, then don’t be dismayed because your dentist has a solution to improve your self-esteem and help you make the type of impression that you want. 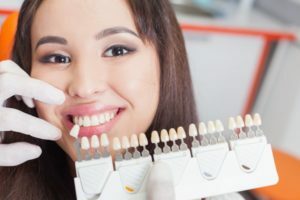 It’s porcelain veneers, and as you continue reading you’ll learn more about what this form of cosmetic dentistry can do for you. Cosmetic dentistry is the type of dental care that addresses the aesthetics of your smile by correcting or masking imperfections in your teeth. And one of the more popular methods of delivering a perfect smile in a short time span is porcelain veneers. Veneers are thin ceramic shells that are custom made to fit the contour of your teeth. They are used to address mild misalignments, gaps, crookedness and stains. The process of having them placed is super simple and only takes two visits to complete. At the first appointment your cosmetic dentist of North Dallas will record images of your mouth to be used in the fabrication of your permanent veneers, and he’ll also shave a small amount of enamel from your teeth. You’ll then be fitted with a temporary set. It will take a couple of weeks to craft your permanent veneers and once they’re ready, you’ll go in for your final visit to have them affixed. Easy Process – The procedure of having your new veneers placed is relatively fast and minimally-invasive. Appearance – Because veneers are ultra-thin, they’ll look just like your natural teeth and blend in perfectly. Customization – Before your new veneers are crafted, your dentist will consider your skin tone, the shape of your face, the width of your smile and the color of your other teeth, amounting in a highly customized process. Stain-Resistance – Another advantage of porcelain veneers is that they are highly resistant to staining, but that also means that you’ll need to take extra precautions with the foods and drinks you consume, as they can still discolor your other teeth. Longevity – Cared for properly, dental veneers can last for a decade or more. Brushing and Flossing – While your new veneers aren’t subject to decay, your teeth still are. Therefore, to ensure that your veneers last, remove the leftover food particles and bacteria that lead to oral problems by brushing and flossing at least twice a day. Avoiding Tobacco Products – Although your porcelain veneers are highly resistant to staining, the nicotine and tar found in tobacco products can turn their pristine color into an undesirable yellow and ruin your perfect smile. But by applying what you’ve learned, you can expect to have a marvelous experience because after you get your new veneers, you will not only make powerful first impressions but will also experience the thrill of feeling your confidence sore! An Accredited Member of the American Academy of Cosmetic Dentistry since 2001, Dr. Dale W. Greer earned his Doctor of Dental Surgery degree from the Baylor College of Dentistry. Voted as “One of the Best Dentists in Dallas” by his peers, Dr. Greer practices at Dale w. Greer DDS, Inc and can be reached for more information through his website.